South Elmsall Market01977 722725work MarketSouth Elmsall hold an open market every Tuesday, Friday and Saturday and a re-use market on Thursdays. Goods for the home range from carpets to pot pourri and scented oil burners. 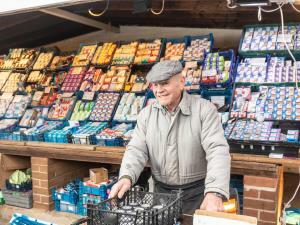 South Elmsall hold an open market every Tuesday, Friday and Saturday and a re-use market on Thursdays. There is a butcher, wet fish stall, fruit and vegetables, greetings cards and clothing for adults and children. Located just off the B6422.